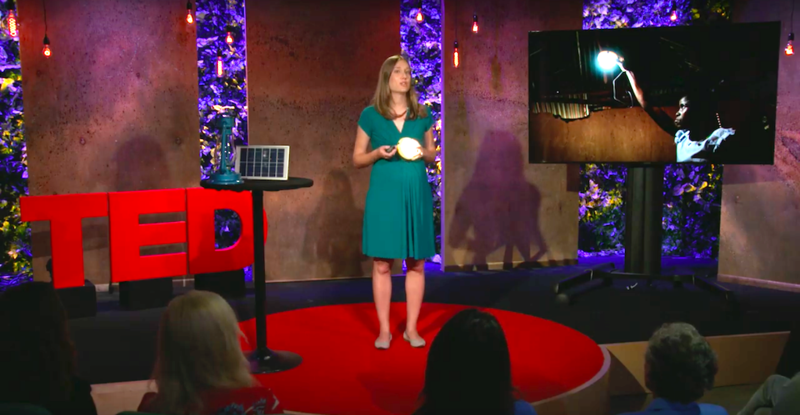 On September 25, 2018, Angaza CEO Lesley Marincola joined 12 speakers and two performers at “We the Future,” a day of talks at the TED World Theater presented in collaboration with the Skoll Foundation and the United Nations Foundation. Some of the most pressing global challenges and emerging solutions were presented during this invitation-only event. Lesley Marincola demonstrated how Angaza’s Pay-As-You-Go technology and alternative credit scoring methods have granted more than 5 million people access to life-changing products around the world. Watch her inspiring TED Talk, or read the the transcript below. Who here has a bank account? How about a credit card? What have these two things enabled you to do? You might have used your bank account to save up money over time to pay for your child’s education. You might have used your credit card to help finance your car. You may have even leveraged your credit history to help secure a mortgage to purchase your own home. I’m going to ask you now to imagine your world without that bank account or that credit card. A world without savings or credit. This is the reality for over 2 billion people across the planet. Two billion people must store their cash under a mattress because they do not have a bank account to deposit it into. Two billion people can only buy what they can afford that day using cash in hand, because they do not have a credit card that enables them to pay later. These 2 billion people live in poverty, not just because their income is small, but because they lack access to modern financial services that can bridge the gap between their short-term income with their long-term needs. I believe there’s a way to start changing this reality, and effectively tackle poverty at a global scale. For billions of people in developing regions across the globe, where the quantity of dollars is hard to come by, access to savings and credit will multiply the power of each dollar earned. This is a kerosene lamp. If you live off-grid in rural East Africa, you cannot simply flip a switch for light. Every night, when the sun sets, you must strike a match to light a kerosene lantern. This is your only source of light. You are burning jet fuel and are struggling to see from the dim glow of the lantern, as you cough from the fumes. What you might not know is that you are inhaling the equivalent of smoking two packs of cigarettes each night when you use your kerosene lantern. What you definitely do know is how expensive that kerosene is. You earn about $20 per week; and you burn $2 of that hard-earned income each week to buy a litre of kerosene. That’s 10% of your income … spent on toxic, dim, and dirty light. Your neighbor owns a solar light. At night, her home is bright and the air is clean. Her children study together all evening until it’s time for bed. What’s more, she does not need to pay for her light because she paid it off months ago. Her home is now powered, for free, by the sun. Products like this solar light could mean the end of energy poverty for every kerosene-dependent household. Yet with billions of people living off-grid, why do so few have these in their homes? Well, there’s a barrier to accessing these solar home systems; the barrier of upfront cost. A typical family living in poverty will simply never have enough cash in hand at one time to be able to buy a solar product outright. When you don’t have a bank account or any way to save money, then $100 for a solar light purchase is an insurmountable barrier. Especially when compared against the cost of a kerosene lamp — only about $5 — and the cost of a week of kerosene fuel — $2. This Pay-As-You-Go model allows life-changing products, like solar home systems, to be sold at a low upfront cost, which anyone with only cash under a mattress can immediately afford. Then, the remaining payments are collected over time until the device is fully paid off. With Pay-As-You-Go, off-grid families can overcome the barrier of upfront cost and own their own solar system for less than what they spend burning kerosene on a weekly basis. Now, offering a $100 product on credit to some select individuals might work, but how could we confidently offer this type of credit to millions of unbanked people? A challenge this great demands that we understand the unique realities of off-grid consumers, because we can’t assess their credit risk using the same data variables that credit agencies might analyze in the U.S. An unbanked, off-grid individual in an emerging market, likely has no collateral, no fixed address, no steady income, no official digital identity, and no real track record of financial activity. So, we have to either figure out how to assess the credit risk of a person with no financial history, or we have to find a way to confidently assume the risk of providing credit to someone without a credit profile. My company, Angaza, has found a way to address this problem. We embed metering technology inside electronic products like solar home systems, and we use alternative credit scoring methods to assess a borrower’s risk level. With this combination, we have already enabled millions of people to access solar energy systems that they’re unable to buy outright. For electronic products like solar energy systems, an embedded metering technology enables the device to turn on or off based on the user’s payment status. The product will not work if the user does not make their weekly energy payment. The average off-grid borrower already knows the concept of Pay-As-You-Go installments well; they likely already pay for kerosene or mobile airtime in small amounts over time. This metering technology assures payment and is the first step towards securing credit. We work with manufacturers to embed this metering technology into a range of solar home systems so solar distributors in emerging markets can confidently extend loans to unbanked individuals. In addition to this embedded metering technology, we also seek to assess credit risk when no official credit profile exists. To do this, we consider characteristics a rural consumer does have that could signal low credit risk, such as their airtime usage, the material their house is built from, their ownership of other products, or the type of crop they grow. What time of day do they pay? Do they make smaller, more frequent payments or larger, less frequent payments? All these factors can be used to better understand this consumer base and increase access to modern financial services. The process of purchasing a solar home system is perhaps just as important as owning one, as this has bestowed the customer with a digital and financial credit profile. By making regular payments, an individual becomes eligible to acquire larger loans for larger purchases in the future. Pay-As-You-Go enables access to purchasing power never before experienced by this low-income, unbanked population. To effectively fight global poverty, we should not solely focus on how to increase the money that families earn. We must also expand the power of their income with access to savings and credit.